The Cassidy Jets shrugged off the rust and overcame an early 10-0 deficit to defeat the visiting Valencia Firebats 36-16 and emerge victorious in their Eurobowl Debut. Quarterback Dax Michelena threw 4 touchdown passes and ran in another to begin his Cassidy Jets career in style. Mark Cohen appears to once again be the number one target as evidenced by his 10 receptions for 138 yards and 2 touchdowns. Valencia controlled the first quarter and were able to move the ball with ease as they marched down the field twice before being halted in the redzone, both drives ended with field goal attempts for Carles Redon. The Spaniards first effort, a 35 yarder into a strong wind, sailed wide of the left upright but his second, this time from 25 yards, stayed true splitting the posts for a 3-0 lead as the first quarter expired. Unable to get any offensive momentum going the Jets defence was soon back out on the field. It didn’t take long for quarterback Fernando Altarriba to take advantage of the over worked unit, picking out his favourite receiver Gonzalo Carbajosa who avoided would-be tacklers as he scampered 48 yards for a touchdown. Redon was on hand to convert, stretching the lead and planting Coventry in a 10-0 hole. Running backs Steve Coles and Kofi Campbell were unable to find any room as the Cassidy Jets ground game was stifled by Valencia’s speedy defence. Michelena however did manage to find openings for runs of 43 and 25 yards providing Coventry’s only early offence. As the American quarterback’s rushing ability became apparent the Firebats were forced to bring more men up to contain the threat. That provided the opening Offensive Co-ordinator Tony Athersmith was looking for as he unleashed the Jets passing game. Michelena connected on 4 straight passes to move the Jets downfield before hitting Jeremy Simms in the endzone for an 11 yard touchdown narrowing the deficit to just four points. The Jets endured a miserable afternoon as they failed convert any of their 6 point after attempts, the first was hooked wide as gusting winds pushed Coles’ kick past the left post. On the ensuing possession linebacker Parm Sidhu handed the Cassidy Jets complete control of momentum. Moving out into pass coverage Sidhu perfectly read Altarriba’s short pass to step in front of his man and grab his first interception of the season. Now hitting full stride Michelena completed passes to Simms and James Hossack before connecting with Joe Black who split the 2 safties to run untouched for a 35 yard score. The Firebats looked somewhat shell-shocked as half time approached. 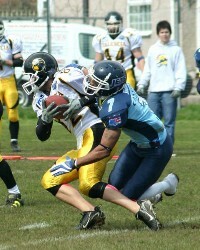 Defensive Captain Paul Newey snuffed out Valencia’s next drive giving the Jets the ball back in scoring position. Michelena again looked in the direction of Simms whose acrobatic grab appeared to be enough to send the Jets in on a real high, however, much to the surprise of all Simms was adjudged to have landed out of the back of the endzone. The second half began with a bang. Kofi Campbell broke numerous tackles, one with the aid of a thunderous block from Michelena, as he rumbled 68 yards for the score. Less than a minute later the Jets had the ball back as a hobbled Altarriba couldn’t recover an errant snap and Prince Floyd collected on the Firebat’s one yard line. Michelena, who hails from the same University as former Jet QB Joe Wright, was able to force the ball over the goal line thanks to a tremendous second effort. Debutant linebacker Alistair Bailey, who led the team with 7 tackles, ended Valencia’s next possession with his first Interception. Coventry couldn’t capitalise though as Michael Holbok recovered a high snap that sailed over Michelena’s head. The Jets didn’t have to wait long though, on their next drive Michelena hooked up with Cohen 4 times culminating in a 7 yard touchdown. Dominic Olney made a triumphant return to the Jets fold. The Coventrian, who played parts of last season with the Birmingham Bulls and Finnish club Seinäjoki Crocodiles, amassed 6 tackles and his bone jarring hits broke up 3 passes and set the tempo for a defence that dominated the second half. Coventry ended the contest midway through the fourth quarter. Tony Perkins took a screen pass and sprinted down the right sideline gaining 55 yards before Martin Andre was able to bring him down. Cohen collected his second TD two plays later with an 18 yard reception from Michelena. As the Cassidy Jets rotated their squad Valencia capitalised with a deserved consolation. Andre, who gave Coventry a scare at the Ricoh with his late interception for the Olympians last season, beat rookie Adam Grindrod’s coverage for a 28 yard touchdown. The ensuing onside kick failed and the Cassidy Jets were able to run out the clock on a memorable victory. Attention now turns to next week’s group game as the Oslo Vikings travel to Valencia. The Jets have the week off due to the cancellation of their game versus the Olympians and will be very interested in the result as they travel to Oslo the following week for what will most likely be a group decider.